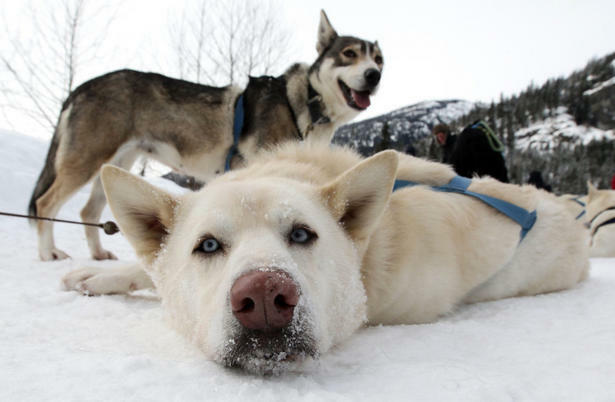 It's been one year since the investigation into the mass culling of 100 sled dogs in British Columbia, (though that number has now been placed at 50) and nearly two years since the event itself took place. Now, according to an article, it seems unlikely that any charges will be laid. So let me get this straight. Both "Outdoor Adventures Whistler", the sledding responsible for the dogs, and Bob Fawcett, the individual assumedly responsible for the killings (in the aftermath of the event Fawcett filed a PTSD claim), have claimed responsibility. Yet the Crown Counsel is still working on this "complicated file"? What exactly is so complicated? The BC SPCA conducted a $250 000 investigation, with the recommendation that the individual responsible for the culling be charged. That has still not happened. Meanwhile, "Outdoor Adventures Whistler" continues to receive "healthy" bookings. One outcome of the event was stronger animal cruelty laws being enacted in BC, with punishments raised from up to $10 000 and six months in jail to up to $75 000 and two years in jail for serious offenders. Here's the problem, and I've said this before in a previous post : you can raise the punishments all you want, but THESE PUNISHMENTS MEAN ABSOLUTELY NOTHING IF THEY ARE NOT ENFORCED! If the courts are not going to follow through on said punishments, the whole point is moot. In the meantime animal abusers will continue to get away with literal and figurative murder, with only the warning of a slap on the wrist and not, heaven forbid, an actual slap. Feel free to express your thoughts in the comments below.